Clemson Coach: "Easy to say we have a race problem. No, we have a sin problem." Sports has been depressing lately. From the behavior of Ryan Lochte and some of America’s olympians at the Rio Olympics to NFL QB Colin Kaepernick sparking a chain-reaction of protests to America’s national anthem, it has been getting harder and harder to look up to our sports heroes. ESPN isn’t helping, either. Sports has long been regarded as a break from the daily grind, and a relief from the political tumult in the world. In many of ways, its divorce from politics has been regarded as sacrosanct for the news-weary American. A place where we can all get together and bond/disagree on something that will not permanently impact America’s cultural and political future. Instead, ESPN has turned our sports broadcasters into MSNBC on steroids, and actively inserts progressivist talking points on any political issue they can get their hands on. That’s why Clemson coach Dabo Swinney’s recent rant on America’s view on race is such a breath of fresh air. 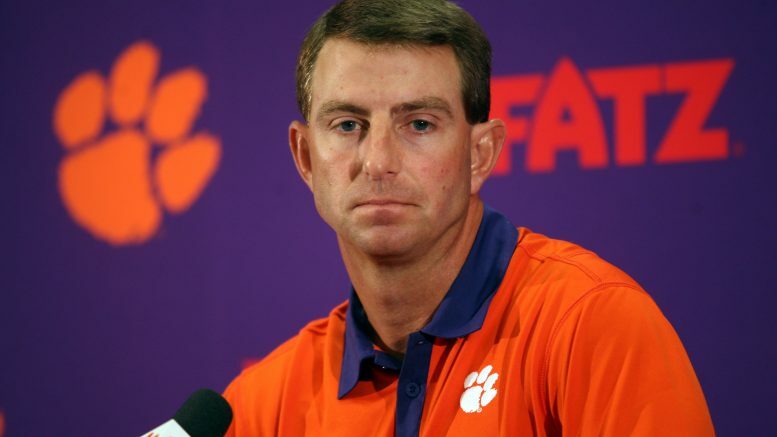 Clemson is (right now) one of the top-ranked college football teams in the country, and Dabo Swinney is a devout Christian, also regarded as one of the best coaches in the game. In his weekly press conference, Coach Swinney was asked about the issue of race (spurred on by Colin Kaepernick’s recent protests). Instead of dodging the question or giving us a watered-down answer, Swinney gave us some remarkable insight into how we should teach each other and the damaging affect sin has on this world. “I think we have a sin problem in the world. That’s what I think. You can watch Swinney’s press conference below. The really good part starts right after the 28-minute mark.